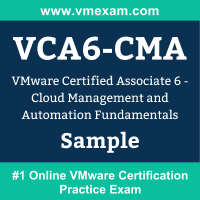 We have prepared VMware Certified Associate 6 - Cloud Management and Automation Fundamentals (1V0-603) certification sample questions to make you aware of actual exam properties. This sample question set provides you with information about the VCA6-CMA exam pattern, question formate, a difficulty level of questions and time required to answer each question. To get familiar with VMware Certified Associate 6 - Cloud Management and Automation Fundamentals (VCA6-CMA) exam, we suggest you try our Sample VMware 1V0-603 Certification Practice Exam in simulated VMware certification exam environment. We have prepared VMware Certified Associate 6 - Data Center Virtualization (1V0-621) certification sample questions to make you aware of actual exam properties. This sample question set provides you with information about the VCA6-DCV exam pattern, question formate, a difficulty level of questions and time required to answer each question. 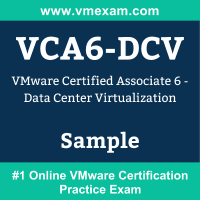 To get familiar with VMware Certified Associate 6 - Data Center Virtualization (VCA6-DCV) exam, we suggest you try our Sample VMware 1V0-621 Certification Practice Exam in simulated VMware certification exam environment. We have prepared VMware Certified Associate 6 - Desktop and Mobility Fundamentals (1V0-605) certification sample questions to make you aware of actual exam properties. This sample question set provides you with information about the VCA6-DTM exam pattern, question formate, a difficulty level of questions and time required to answer each question. 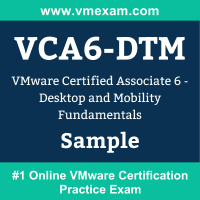 To get familiar with VMware Certified Associate 6 - Desktop and Mobility Fundamentals (VCA6-DTM) exam, we suggest you try our Sample VMware 1V0-605 Certification Practice Exam in simulated VMware certification exam environment. 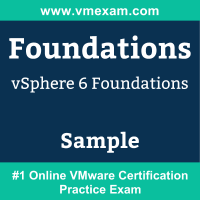 We have prepared VMware vSphere 6 Foundations (2V0-620) certification sample questions to make you aware of actual exam properties. This sample question set provides you with information about the Foundations exam pattern, question formate, a difficulty level of questions and time required to answer each question. To get familiar with VMware vSphere 6 Foundations exam, we suggest you try our Sample VMware 2V0-620 Certification Practice Exam in simulated VMware certification exam environment. We have prepared VMware Certified Professional 6 - Data Center Virtualization (2V0-621) certification sample questions to make you aware of actual exam properties. 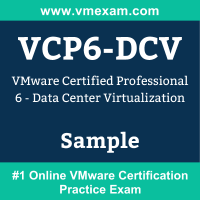 This sample question set provides you with information about the VCP6-DCV exam pattern, question formate, a difficulty level of questions and time required to answer each question. To get familiar with VMware Certified Professional 6 - Data Center Virtualization (VCP6-DCV) exam, we suggest you try our Sample VMware 2V0-621 Certification Practice Exam in simulated VMware certification exam environment. We have prepared VMware Certified Professional 6 - Network Virtualization (2V0-642) certification sample questions to make you aware of actual exam properties. This sample question set provides you with information about the VCP6-NV exam pattern, question formate, a difficulty level of questions and time required to answer each question. 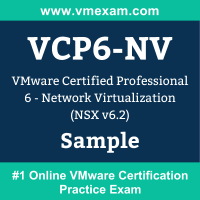 To get familiar with VMware Certified Professional 6 - Network Virtualization (NSX v6.2) (VCP6-NV) exam, we suggest you try our Sample VMware 2V0-642 Certification Practice Exam in simulated VMware certification exam environment.